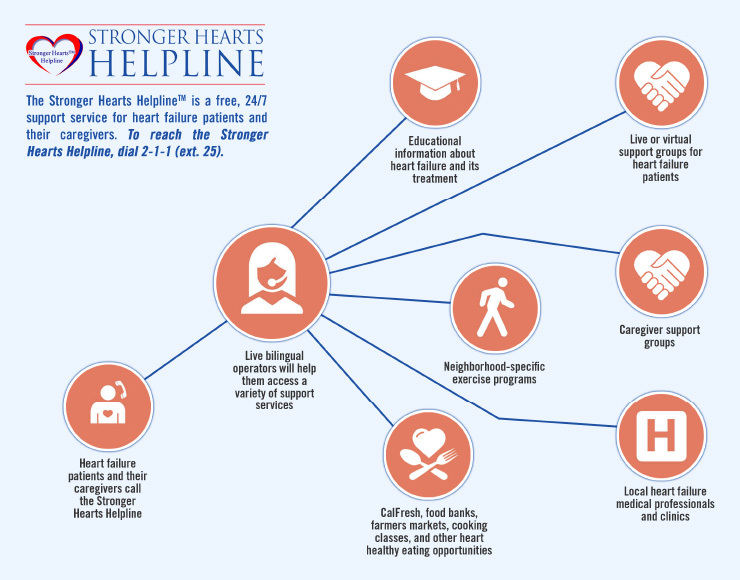 The Stronger Hearts Helpline is a free, bilingual (Spanish) heart failure support service that is available to people 24 hours a day, 7 days a week. It provides people who have heart failure and their families/caregivers access to community resources that can help them better understand and manage the disease. Assistance finding heart failure professionals and clinics. Additional information about heart failure and its treatment. Help with arranging non-emergency needs, like transportation to a doctor’s appointment, delivery of prescription medications, and finding exercise programs, nutrition information and mental health programs. Approximately 14% of Medicare patients are being treated for heart failure – that’s about 1 in 5 seniors. Heart failure treatment accounts for more than $30.7 billion annually nationwide. About 50% of people diagnosed with heart failure die within five years of diagnosis. map the helpline’s role in building a Culture of Health, with a focus on its current contributions and potential leverage points.